Can a hog farm bring home the bacon? MELLETTE COUNTY, S.D. - In this vast, largely empty sea of rolling prairie grass, where little is shiny and new, the sun mirroring off the galvanized silver roof panels of 24 enormous, brand-new hog barns is a remarkable sight. It's the start of the largest-ever development on the Rosebud Sioux Reservation. North Dakota-based Bell Farms plans to build 232 barns to house 869,000 market hogs a year, and the company has promised the tribe more than 200 jobs, 25 percent of the facility's profits and an option to buy the entire operation in the future. The jobs and profits might be a windfall for tribal members, who live in the poorest county in South Dakota (HCN, 6/21/99). Since only about 1,000 of the 24,000 resident tribal members have jobs, former tribal president Norman Wilson says the hog barns look like a long-sought opportunity. "I want to put the head of the family back to work and providing for his family," says Wilson. "For the lack of being needed, the head of the family has turned to alcohol, probably, and the once-proud warrior that they were is no longer there." Many tribal members thought the hog farm might solve these troubles, and support for the project was widespread at first. But critics on and off the reservation argued that the $105 million mega-farm was rushed through the political process with little regard for environmental laws, and opposition began to grow. The farm's detractors showed their strength in the most recent tribal election, when hog-farm critic William Kindle was elected as president, and many farm supporters on the tribal council were voted out of office. On the Rosebud Reservation, the political winds may have started to shift. 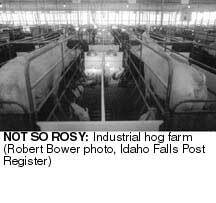 Hog waste is the big concern. Bell Farms plans to build nearly 600 acres of waste "digesters" and open-air evaporation ponds at the Rosebud facility. That's a surface area large enough for a 1,200-home subdivision. If built to capacity, the facility could generate roughly twice as much biological waste as South Dakota's entire human population. Decomposing waste can produce terrible odors and dangerous gases, and even though only a small fraction of the planned number of hogs are now on site, neighbors already complain about the smell. Opponents also worry about the effects of any waste spills on the White River, less than five miles away and downhill from the hog facility. Many Anglo ranchers who lease nearby reservation land fear that hog waste would contaminate the shallow groundwater wells used to water livestock. Backers of the facility say there is nothing to worry about. Bell Farms, which refused to comment for this story, says odor from the facility will be minimal and that the barns and lined waste lagoons would be built on top of a thick, impermeable shale deposit that will protect groundwater. The company says the waste will be disposed of "appropriately," but has not yet produced a specific plan. The Rosebud Sioux Tribe will be primarily responsible for monitoring the company's impact on the environment, and former president Wilson had planned to set up a pollution-monitoring committee. Because the reservation is a sovereign entity, the state of South Dakota has no jurisdiction there, and federal oversight is limited. The Bureau of Indian Affairs could have required an environmental impact statement, but it called for a less stringent environmental assessment instead. The Bureau's review found that the hog farm would have "no significant impact" on the environment. The agency's approval brought on a lawsuit from a coalition of tribal members and environmental groups, including Concerned Rosebud Area Citizens, the Prairie Hills Audubon Society, and the South Dakota Peace and Justice Center. The Bureau then reversed itself and ordered an environmental impact statement, only to find itself faced with a countersuit from Bell Farms and the tribe. The case is still pending in federal appeals court. There hasn't been any new construction on the site since the summer. The Environmental Protection Agency, which sharply criticized the Bureau of Indian Affairs' environmental assessment review as "inadequate," has since worked closely with the tribe and Bell Farms on the hog facility proposal. "It isn't our job to stop these things," says Kerrigan Clough, assistant regional administrator for the Environmental Protection Agency in Denver. "It's our job to work with the government and make sure they're done correctly, so that they get both values - the economic development and the environmental protection." After its consultation with the tribe and the company, the EPA concluded that the project was "more environmentally protective" than the original review had described. The agency has now approved the construction of 72 hog barns and three 55-acre evaporation ponds and waste digesters, but has not yet examined plans for the additional 160 barns and 10 waste lagoons. Clough is confident that if the entire facility is built to the same specifications as the portion already constructed, it won't leak or otherwise discharge waste. The Sierra Club, which recently joined other environmental groups in opposition to the hog farm, doesn't agree. "We think the (Environmental Protection Agency) is flatly wrong and we're prepared to contest that in a litigious manner," said Ken Midkiff, coordinator of the Sierra Club's national clean water campaign. Midkiff is outraged that the agency is not requiring the facility to obtain a waste-discharge permit under the federal Clean Water Act. He believes that if the Rosebud hog venture proceeds without a discharge permit, the project will encourage further mega-farm development in the arid West. "The fact is, these facilities will discharge," said Midkiff. "You cannot operate a facility of that size without accidents. It just goes without saying." In the meantime, tribal opponents of the hog facility hope they've found an ally in Kindle, the new president, and in many of the 15 new members of the 20-seat tribal council who spoke against the hog farm during the election campaigns. Though poverty remains a dire problem on the reservation, some still say the hog farm isn't the answer to their woes. "Economic development isn't worth that much, to affect the land forever, and to ruin an area such as the Rosebud reservation, just for a few dollars and a few jobs," said tribal member Richard Mednansky, a rancher, hunting guide and activist. "It ain't worth it." Eric Whitney works for the High Plains News Service in Billings, Mont. Note: in the print edition of this issue, this article is accompanied by a sidebar, "Floyd brings on a hurricane of hog waste." * Sierra Club, Clean Water Campaign, 573/815-9250.